My Chipotle Butternut Squash Panzanella Salad calls for a quality baguette, squash, and fresh arugula. The perfect canvas to drizzle this sweet and tangy Spicy Maple White Wine Vinaigrette over. I did a sugar detox and have since been using mostly natural sugar substitutes in place of refined white sugar. Honey, maple syrup, and local sorghum are at the top of the list. 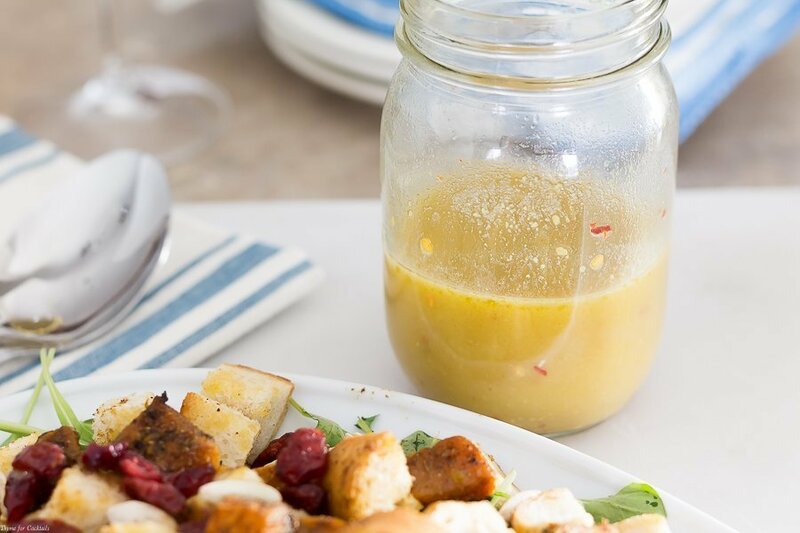 Maple syrup pairs beautifully with the slightly oak chardonnay in this vinaigrette recipe. Dijon mustard adds a nice tanginess while lemon juice, fresh garlic, and a generous amount of red pepper flake round out the recipe. I used a mild white wine vinegar for a subtle punch. 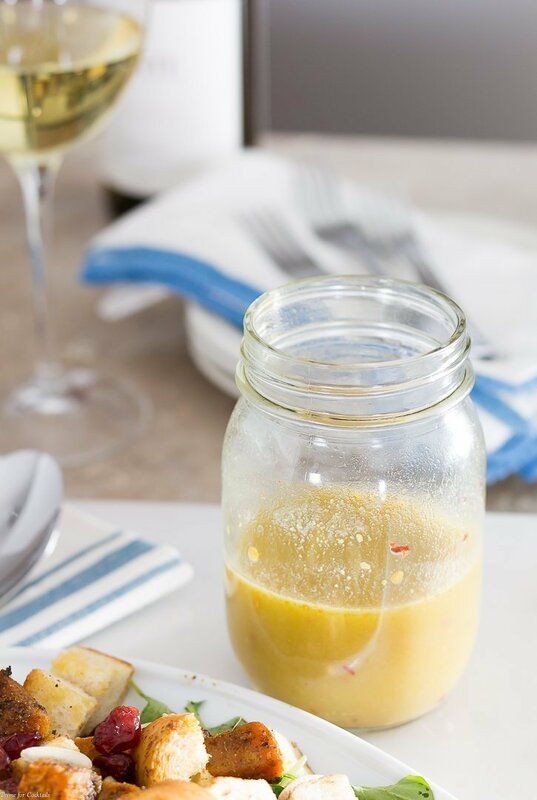 This Spicy Maple White Wine Vinaigrette recipe would make an excellent marinade for pork too. You could even reduce the amount of extra virgin olive oil and brush it on as a finishing glaze for baked chicken. 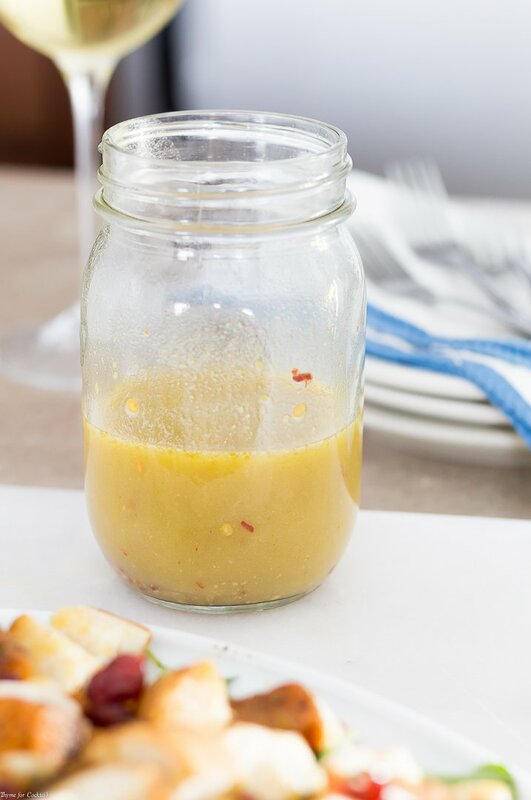 I hope you like this Spicy Maple White Wine Vinaigrette recipe as much as my crew does. 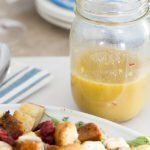 If you love this seasonal vinaigrette recipe, you can find more like it by checking out my other salad dressing recipes! For daily recipe inspiration, subscribe to my newsletter, follow me on Instagram, and for generally inappropriate humor follow like me on Facebook! Add all ingredients to a lidded jar. Close and shake to combine. Store in an airtight contain in the refrigerator for up to 2 weeks. Oil will solidify in the refrigerator. Let vinaigrette come to room temperature and shake to combine before serving.